What is a Bruised Toenail? I’m sure that most people have suffered the odd bruised toenail at some point during their lives. In most cases, they are caused by simple bumps like dropping something heavy onto the toe or stubbing your toe on some sort of hard object. While they are not usually very serious issues, they can be debilitating and in some cases take some time to heal fully. It is not the nail itself which gets bruised since the nail is made up of dead tissue although the nail appears to be bruised and discolored. Rather, it is the tissue beneath the toenail that is bruised. The bruise is known medically as a subungual hematoma which basically means blood beneath the toenail. It is this build-up of blood beneath the nail which caused the discoloration, swelling, and pain. Bruised toenails are usually nothing to worry about long-term. They are typically caused by trauma, sporting injuries (especially running), wearing poorly fitted shoes and occasionally by certain medications. A bruised toenail will usually heal on its own given enough time. A bruised toenail is known medically as a subungual hematoma. The appearance of bruising on the toenail is caused by the pooling of blood in the tissue beneath the nail. You can prevent a bruised toenail by wearing properly fitted shoes and keeping your toenails clipped. If your toenail falls off, it can take up to 6 months to grow back fully. 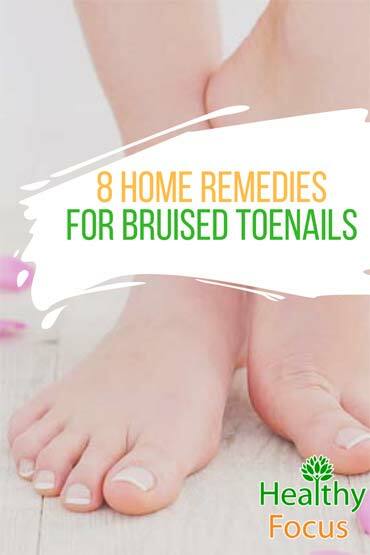 There are a number of potential home remedies for bruised toenails including arnica oil, various essential oils, aloe vera gel and witch hazel. Toenail bruises can be caused in a variety of ways. These are some of the most common causes. Trauma: Trauma and injury caused by dropping a heavy object onto the toes or simply stubbing your toes into a hard object are the most common causes of a bruised toe. Rigorous Exercise: Athletes and runners, in particular, are especially prone to bruising of the toenails owing to the extreme and repetitive pressure put on the toes as they run. People who suddenly increase their level of exercise are also at risk of bruising. Running Downhill: Similarly, running or even walking downhill for long periods can put a lot of pressure on the toes and cause the toenails to come into constant contact with the seams of your shoes. Poorly fitting Shoes: Either footwear that is too small or otherwise ill-fitting will increase the friction and pressure exerted on your toes and increase the risk of bruising. Sporting Activities: Certain sports that call for fast movements can cause increased pressure on the toenails. There is an increased risk of injury and trauma in sports where kicking a ball is involved such as soccer. Certain Medications: Taking blood thinning medications increases the risk of developing bruises including toenail bruises. The vast majority of the time, a bruised toenail should not cause you to worry and they will heal of their own accord in time. Unfortunately, they can be extremely painful and when the toenail is severely bruised, it can die and eventually may even fall off. There are plenty of ways that you can help take care of your bruised toenails and also certain natural remedies that you can try to help speed up the recovery and reduce inflammation and pain. 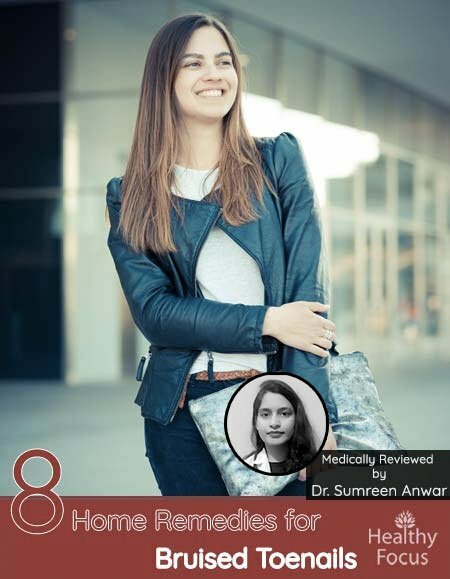 Before we look at the best natural remedies, let us take a look at some basic preventive measures and tips that can help you recover fast. Wear Properly Fitted Shoes: Athletes, in particular, should choose shoes that fit well as ill-fitting shoes can cause injuries and bruising to the feet and toes. Trim your Toenails: You should trim the toenails evenly across your toes making sure that the nails are cut flat rather than round. Cold Compress: Use a cold compress to reduce swelling and pain. Simply wrap a towel or cloth around some ice cubes and apply the compress your damaged toenail. Elevate your feet: Keeping your foot elevated at home and at work helps to reduce blood flow into the damaged part of your toe. This will relieve pain and swelling. Warm Water Soak: Warm water can help soothe the pain and inflammation. Simply soak your foot in a bowl of warm water a few time each day until your toe has recovered. Adding a few drops of essential oils such as lavender can help ease the injury even more effectively. Avoid Rigorous Activity: Exercise and rigorous physical activities will not allow the toenail to recover and may cause further damage. Medication: Over the counter painkillers and anti-inflammatory medications can help relieve pain and inflammation. As well as the tips listed above, there are many effective natural remedies that can help your bruised toenail to recover faster. Remember that if the injury is especially severe, it is important to see your doctor. These remedies are not intended as a substitute for medical treatment but for less severe forms of bruising, they can be extremely effective, cheap and convenient. Arnica which is an herb related to the sunflower is an excellent natural remedy for bruised toenails and bruising in general. It has highly anti-inflammatory properties and when applied to your injury can help relieve swelling and pain while improving the circulation of blood. Arnica is available in several different forms. To treat your bruised toenail, it is best to use the arnica gel rather than a cream as it dries more quickly without leaving your toenail feeling greasy. You can also use arnica tincture diluted with water. Apply either form of the herb a few days each week until your injury has healed. Most essential oils possess excellent natural anti-inflammatory actions making them perfect for your bruised toenails and bruises in general. Some oils like peppermint are also naturally analgesic and can help to ease your pain as well as your swelling. There are a wide variety of essential oils that can help treat your bruised toenail but some of the best include tea tree, peppermint, lavender, eucalyptus, and chamomile. There are several ways to use essential oils to help your bruised toenail to heal. Dilute your essential oil with a carrier oil and apply it to the bruised toenail and surrounding toe. Do this several times a day. Put a few drops of your essential oil in a bowl of warm water and soak your foot in the solution for around 15 minutes several times a day. Add 5 or 6 drops of your chosen essential oil to a warm damp cloth and apply it to your bruised toenail. Turmeric contains very strong anti-inflammatory properties as well as antimicrobial compounds that can help relieve swelling and prevent future infection. The best way to apply turmeric to your bruised toenail is in the form of a paste. To make your paste add sufficient water to a tablespoon of dried turmeric powder and mix well until you have a smooth paste. Apply the paste to your bruised toe twice daily. Some people recommend applying mustard oil to the toe to treat bruising, inflammation and pain. Simply massage the mustard oil directly into the bruised toe several times a day. Alternatively, you can add some mustard oil to some flour and make a dough to wrap around the toe. Aloe vera is an excellent natural remedy for skin conditions and bruising caused by injuries. You can either extract the gel from a fresh aloe leaf or use ready-made aloe vera gel. Simply apply the gel to your bruised toe and toenail several times each day until your bruising has dissipated. Witch hazel is another herb with excellent anti-inflammatory actions. Simply add some witch hazel to a little water and wash the toenail with the solution several times each day. Plain water with salt added can also help relieve the pain and inflammation and improve circulation better than soaking the foot in water alone. Just add 2 tablespoons of table salt or sea salt to a bowl of warm water and stir well. Soak your foot in the solution for 5 to ten minutes 2 or 3 times a day to help the bruise heal up faster and keep the toes clean. Instead of using a plain warm compress, you can get even greater benefits by adding some herbs to the treatment. Some of the best herbs to use in a compress are chamomile and lavender both of which have excellent anti-inflammatory properties. Make up a mug of chamomile or lavender tea by adding a teaspoon or so of dried flowers to boiling water. Let the mixture steep and cool then use the solution to make a compress. Apply it to your bruised toenail several times each day. How long does it take to heal a bruised toenail? If the area beneath the toenail is bleeding quite badly, your nail is likely to drop off after a few weeks. This happens because the build-up of blood beneath the nail separates the nail from its bed. It can take up to 6 months for a toenail to fully regrow. This is much longer than the time it takes for a new fingernail to grow. What are the best home remedies for a bruised toenail? There are plenty of home remedies to help treat a bruised toenail, ease pain and speed up healing. Some of the best include arnica oil, aloe vera, witch hazel, herbal compresses and turmeric paste. Many essential oils are effective when applied topically including peppermint, tea tree, lavender and eucalyptus essential oils. Can a black toenail cause complications? When a black toenail is not caused by bruising but instead is caused by a fungal infection then it may cause further damage. When untreated, toenail fungus can spread through the feet and on to other parts of the body. Complications may also occur when melanoma in the nail is mistaken for bruising caused by trauma. You should see your doctor if black spots appear to be spreading throughout your toenail and if they do not disappear despite the toenail fully growing out. Most of the time, a bruised toenail will not require medical attention. However, if your toenails are blackened with no evident reason then it may be an early sign of a more serious medical problem. First aid treatments do not result in a reduction in pain, swelling, and redness. The bleeding will not stop. Pus drains from the wound. Black patches under the nail could be caused by cancer. If you have a blackened toenail despite no evidence of trauma, you should get it checked out immediately. While a bruised toenail can be painful and debilitating, they are usually no cause for great alarm. You can easily help prevent bruising by wearing properly fitted shoes and keeping your toenails clipped. Unfortunately, there is not so much you can do about an injury caused by dropping a heavy object on your toe or accidentally kicking a bedpost. If you have suffered a bruised toenail, there are plenty of excellent home remedies that can ease the pain and inflammation and help speed up the healing process. We hope that one of the home remedies that we have described does the trick for you. If you have tried any of the remedies in this article, please let us know how effective it was. If you have any other suggestions that have worked for you, we would be delighted to learn about it so we can add it to our list.